During the filming of the Imax National Parks Adventure, Conrad Anker stated that he couldn’t believe that there we no local kids tearing it up at Pictured Rocks National Lakeshore. That comment led to the collaboration between The North Face and Michigan Ice to develop a youth climbing program for the central Upper Peninsula! During the 2016 Michigan Ice Fest, The North Face sold TNF beanies, and MIF logoed Yeti beer colsters and raised over $1000.00 to kick off the Pictured Rocks Climbing Academy! 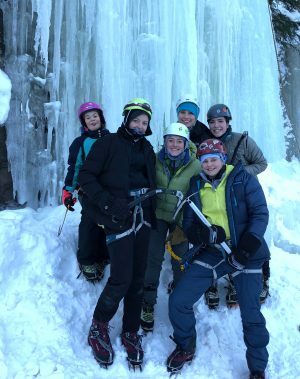 Pictured Rocks Climbing Academy is a free program available to central Upper Peninsula youths ages 9-17 where mentors guide a small group of four participants through a four step program designed to advance the participants rock and ice climbing skills. Our goal is to develop, advise and foster a youth climbing community in the central Upper Peninsula of Michigan. At this year’s Ice Fest you will be able to meet the recipients of this climbing program and who are the future of Michigan Ice! This program is funded through festival registration dollars and a partnership with The North Face. Be sure to stop by the TNF booth as we will be doing another fund raiser for the PRCA!